PCB in bachelite per fuzz face anni ’60. Assemblato con due bc108c selezionati e componenti nos. A scopo indicativo, allego comunque schema elettrico e disegno pratico per facilitarne la costruzione. Germanium / Silicon Hybrid Fuzz, das einfach alles macht: Von dynamisch-klarem Overdrive bis wolliger Fuzzbombe ist alles drin. Zudem kann man dem Schaltkreis über den LED-Regler auch noch Saft entziehen, so dass es noch kaputter oder sogar synthie-artig klingt (Starve). PCB in bachelite per fuzz face anni ’60, versione PNP al germanio, assemblato con componenti nos. Allo scopo vengono allegati (compreso nel prezzo) due transistor e cioè: un transistor SFT337 (Q1) (introvabile) che di questo pedale ne fa la differenza e un transistor AC128 (Q2), ORIGINALI che, su esplicita richiesta, potranno anche essere saldati al pcb. 2 verschiedene FUZZ-Modi, Signalverstärker und 2-Band EQ. Ich habe den oft als Clear Gain Booster genutzt. Dann kein Fuzz sondern nur EQ und eben ein genialer Booster, ohne zu zerren. Zustand: Gebraucht. 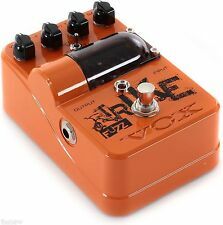 VOX TRIKE FUZZ Specifications. Connections: INPUT jack (guitar input), OUTPUT jack (line output). Accessories: AA alkaline battery x 6 (for verifying operation). Weight: 420 g / 14.81 oz (not including battery). HANDWIRED CONSTRUCTION. Every pedal is 100% handbuilt & handwired. D-250 is a replica of our personal 70's DOD 250 Gray Edition. If any of these parts should fail, I will fix with no extra costs. Check out the demo here. HANDWIRED CONSTRUCTION. Every pedal is 100% handbuilt & handwired. 'Zebra Fuzz' by Transistor Dream. Selected Silicon NOS Transistors. If any of these parts should fail, I will fix with no extra costs. Pedale DEATH BY AUDIO Supersonic FUZZ GUN usato pochissimo. Vendo bellissimo pedale FBT Fuzz FF III made in Italy nei primi anni 70. The pedal works perfectly and is in excellent condition. Univox Super-Fuzz Clone . - DPDT Fußschalter. - ELNA RFS Elektrolyt-Kondensatoren. - Nichicon Polyester-Film Kondensatoren. SUPER-FUZZ . Erstklassiger SUPER-FUZZ Sound ! zum Verkauf steht Hier ein . Wonderful fuzz face handwired in Italy by SD Elettronica. The pedal is the silicon version of the well known pedal used by Jim Hendrix, David Gilmour and Frusciante. Q2 : Mullard OC72 Hfe ~ 127. Q3 : Mullard OC72 Hfe ~ 94. - 3PDT Fußschalter mit LED-Ring ( Rot ). SolaSound MK 1 Fuzz Clone . TONE BENDER MK 1 . Super Sustain ! Feinfühlige Ansprache des Attack Reglers und leichtes Gate wie beim Original ! Pcb in vetronite per fuzz face anni 60, versione npn silicio. Assemblato con componenti nos. Misure del pcb originale rispettate (65mm x 40mm circa). Allego schema elettrico ed indicazioni pratiche utili all’assemblaggio in box. From Arger FX The ARGER CAPRICORN PLUS BASS FUZZ BOOST is a high gain bass fuzz and boost pedal. on the right-hand side. The good thing about the standard CAPRICORN is the fact that it can get really nasty. No scambi, no permute. Per qualsiasi informazione potete contattarmi al 393/5205214, Fabrizio. Lo strega rossa Zeus! Dio greco del cielo, tuono, Basso Fuzz e Suboctave! Pedale rosso strega Zeus in basso Fuzz. Il pedale rosso strega Zeus in basso Fuzz. • Indipendente analogico Fuzz e ottava per basso. Prescription Electronics Experience A faithful recreation of one of the most sought-after Fuzz pedals on the market. Check out Doyle Bramhall II and you know what we're talking about!We just changed a few things to make it easier to use. Inoltre il case dispone di una grafica del leggendario artista Rock Gered Mankowitz. - Il raro tono fuzz di Hendrix ascoltato in alcuni dei più importanti concerti live. Verkaufe ein Cusack Tap a Fuzz. Super Zustand inklusive allen case candys. Up for sale is a Cusack Tap a Fuzz effects pedal. Perfect condition including original box and all case candys. Solidgoldfx if 6 cosa 9 Fuzz bc108cs-come nuovo! Der Grund ist einfach, ich habe mittlerweile zu viele Pedale und irgend ein Opfer muss es halt sein. If 6 Was 9 ist Solid Golds moderne Interpretation des klassischen End 60er / Anfang 70er Jahre Fuzz Face. Il suono del fuzzer classico di culto originale è torna a grande richiesta. Super grande, super vizioso e super intenso. Completare con abbastanza alieni rumori di freak out vostri ascoltatori. Pedale di morte di Audio Micro armonica trasformatore Fuzz. Indicatore LED: on/off, connessioni: jack input 6,35 mm, jack output 6,35 mm, 9V DC. ENO TC-01 Octaver pedale effetti. GB £ 25,00 Nordirland: BT, Kanalinseln Guernsey und Jersey: GY, JE, Äußere Hebriden: HS, Isle of Man: IM, Schottisches Hochland (Highlands) und Isle of Skye: IV, Orkney Inseln: KW, Shetland Inseln: ZE Firth of Clyde Inseln: KA27-28, Region Argyll and Bute mit Loch Lomond und Innere Hebriden: FK17-21, PA20-38, PA41-49, PA60-80, PH16-50, Isle of Wight: PO30-41, Isles of Scilly: TR21-25. Model THE ENGINEER - FOUNDATIONAL BASS OVERDRIVE. Questo consente di comporre una grande miscela di Bass pulito e overdrive. L'INGEGNERE - FONDAZIONALE BASS OVERDRIVE. Guadagno: La quantità di overdrive miscelati in. 2 pedales en une ! un boost lift pedal. Keeley Fuzz Bender è un fuzz moderno a tre transistor che utilizza una combinazione di silicio ad alto guadagno e germanio dalle tonalità levigate. Ciò che distingue il Fuzz Bender è il suo EQ attivo. El Erupter sueña con cualquier typo de micro y en cualquier parte de vuestra cadena de efectos sin problema de impedancia y también antes de un wha-wah. Para eso, el Erupter utiliza una sección de entrada con buffer, un simulador de micro a base de transformador y nuevas resistencias 5% 1/2 de carbón. Wir sind ein spezialisierter Anbieter im Bereich E-Gitarre und Bass. Wir vertreiben ausschließlich Qualitätsmarken. One of the characteristic features of these germanium transistors is their tube resemblance, which ensures a very nuanced sound. Dunlop FUZZ FACE Effektgerät JHF2. - für Gitarre oder Bass. - Dallas Arbiter England. Sehr guter optischer Zustand - siehe Fotos. Shallow Water. K-campo modulatore. MPN Shallow Water, K-Field Modulator. Model Shallow Water, K-Field Modulator. UPC Does not apply.